On the other hand, what I really like about living in the Netherlands and Eindhoven specifically: Eindhoven is a good size city but not too big. I don't really like city living. You know when you think of city life - you think of big cities like Paris, New York, Amsterdam and London. I don't like Amsterdam that much. It's too congested feeling. Although Paris is amazing. But anyway, Eindhoven is actually many smaller villages that grew together and just became Eindhoven. I live in Woensel which is North Eindhoven. I can find everything I need to be happy when it comes to eating - right here in Woensel. Woensel feels very much like a small town in a lot of ways. I run into people I know a lot... everyone pretty much sticks to this side of town. Or they go to the downtown for shopping, movies, eating out, etc.... but otherwise, I think most people are like me and just hang out in Woensel. Eindhoven has a population of about 150,000 but when you look it up online they include some other outlying villages and estimate it at about 400,000. And in Eindhoven there are people from 120 different countries living here. I love - absolutely love the cultural diversity here. My neighbors to the right are originally from Iraq. To the left the neighbors are from Surinaam. And the neighbors two doors down are from Helmond - probably. And I love them all to pieces. Everyone really looks out for each other. We do experience some hate crimes now and again. The other day someone sliced the car tires of everyone on the street that had a flag of a different nation hanging from their mirror. Even the neighbor who is absolutely 100% Dutch had some Iraqi prayer beads hanging from his rear-view mirror and his tires got slashed, too. It's a shame that - that sort of thing happens. But I love my neighbors. They are the best - and I often smell delicious smells waifing out of their kitchens. And that is another thing I like about living in a culturally diverse city. The food! When I first got here I was missing and craving Mexican food so badly... but over time that went away as I experienced what Eindhoven had to offer. I do like the Dutch friettent food - like bitterballen and kroketten. But what I also really like is all the Dutch-Indonesian food, Turkish food, and Surinaams food. If we moved to America, I bet we would miss Turkish pizza. I myself don't eat it much. I buy it for my husband who does not like cheese on his pizza. When you go into a grocery store they have a lot of frozen pizza to choose from. Have you ever noticed how they never have cheeseless pizza? I bet it really bugs people who don't like cheese but do like pizza. 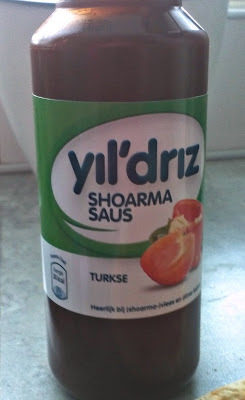 Well, in the Netherlands you can find Turkish pizza in almost every freezer section of most grocery stores. 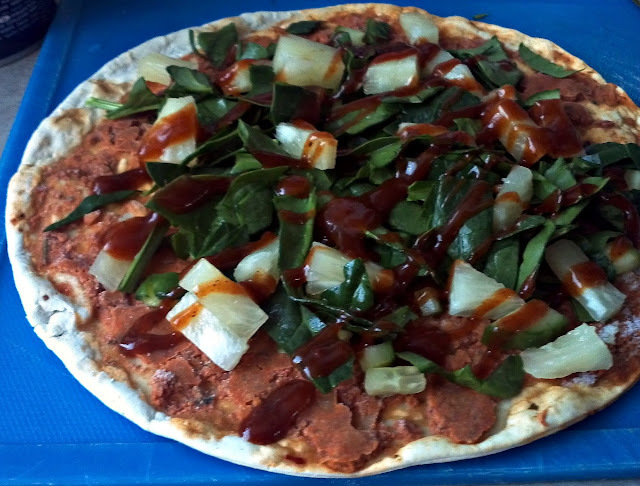 Turkish pizza is a flat bread with some kind of meat mixture on it. That's it. We add our favorite toppings at home. For my husband I usually put some pan-fried mushrooms, canned chopped pineapples, fresh spinach, and diced cucumber on his pizza with a little extra Turkish Shoarma sauce. And then heat it in the oven for 5 minutes or so. Because it's a very thin crust pizza - it bakes very quickly. Then you just roll it up and eat it. 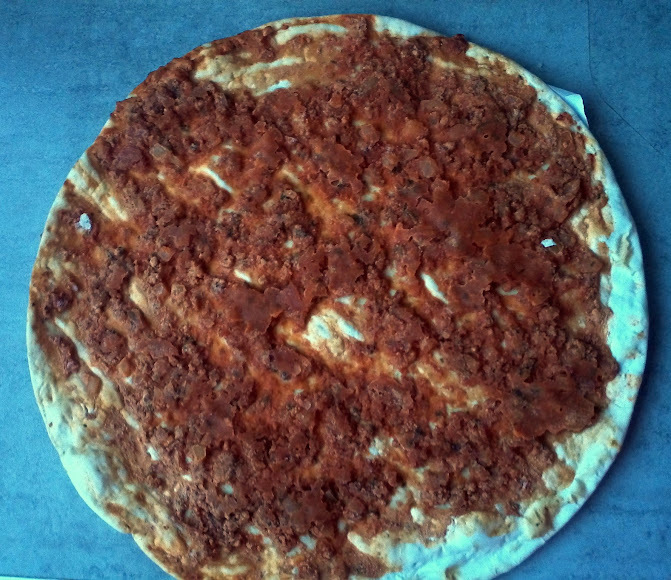 That's Turkish pizza. I usually bake his last because it cooks so quickly, I bake mine and the kids pizza first. The kids usually eat plain salami with cheese pizza. I usually get the vegetarian cheese and pesto pizza. They usually have to bake for 12-14 minutes so we bake ours first, then the oven is nice and hot and Mark's Turkish pizza bakes very fast. We have this for dinner on a regular basis. I am a foodie, I do love to cook good food... but I often have days where I don't feel like preparing much and those are our pizza days. Frozen pizza from the grocery store is a lot cheaper than ordering from Domino's as well. This is how it looks when you remove it from the packaging. With all Mark's favorite toppings...ready to bake. This is our favorite brand Shoarma sauce for Turkish Pizza. Even though I don't eat Turkish Pizza much... I do enjoy lots of Turkish food. Problem is I don't know what it's called. We have this weekly farmers market in my neighborhood. And when the weather is good there are a few Turkish ladies out selling home made goodies at their stand. I usually get the Lahmacum for Mark and then there are these rolled up yummies filled with feta cheese - it tastes like it. And it's in a sort of deep fried pastry. I love those. I don't know what they are called - but I like to buy two or three. The other thing that is super yummy that makes it possible to live without eating out at Mexican restaurants is Turkish fast food - doner kebab. It looks really weird. It's like this chicken spice mixture on a spinning thing that just cooks there all day long and for days on end... probably not healthy at all - but very tasty. They scrape the meat off this thing and put it in bread or a flat bread or tortilla with lots of lettuce and tomatoes and yummy sauce. It's really good! Here they serve it with french fries and just some simple salad. So, as you can see... I am quite happy to live eat here. No really, it's fine place to live once Spring time arrives. Winter has been so gloomy and cold this year. Now that we have had a few days of warmish weather - the kids have been loving it. They spent several hours outside playing and I was so happy for them. Spring time is rather glorious in the Netherlands - especially once you survive a gloomy cloudy - sunless winter here. Chunky Tomato Basil Soup - we pureed it fine and it was so smooth and creamy - deliciousness! I should read your blogs more often. I do so enjoy your writing when I do. And I love the pictures. I am now craving a turkish pizza. When we come to the Netherlands again, it is a must have meal. You are an amazing woman. I hope that you enjoy being you.